One quick note: Statistics show that traffic collisions spike after daylight savings begins, so be extra careful on the streets for the next few days. An Op-Ed from Toronto college professor says pedestrian deaths won’t end until the city stops pandering to cars and drivers. When cars slow down, not only are streets safer, but they become more enjoyable places to be. When good cycling infrastructure is present, people stop being “cyclists” and instead are just normal people going about ordinary, mundane activities. We need to stop thinking that bike lanes are only for “cyclists” and better sidewalks or more crossings are only for “pedestrians.” They are for everyone and they give people choices as to how they get around. Then there’s this from a surprising source — the executive editor of The American Conservative, who notes that it’s become safer to drive and more dangerous to walk — and bike — in recent years. And that the recent report from the Governors Highway Safety Association didn’t go far enough in calling for safer streets. Curiously, there is little attempt by the GHSA to grapple with the very obvious and long-term problem—the conflict that occurs when one attempts to combine pedestrian accessibility with roads that support highway speeds. Even with smartphones locked away and all drivers drug free, there are bound to be incidents in which the operator of a two-ton object barrelling down the road does incredible damage to a defenseless human being of one-tenth the weight. The only sure way to protect the vulnerable party in this situation is to slow vehicles to truly safe speeds wherever pedestrians are present. And the only way to guarantee slower speeds is to create streets—not the all-to-common suburban thoroughfares that accomodate highway speeds—that do not allow drivers to travel through neighborhoods at unsafe velocities. True sharing of the streets between all modes of mobility—including one’s own two feet—demands, as Cortright states so well, that walking and biking are no longer treated as a “second class form of transportation.” This transition will require recovering a rather older form of techne, a craft of building human-centered places, that does not need artificial intelligence or other “smart” devices to save us from the mechanical beasts we have allowed to dominate our streets. On the other hand, some people just don’t get it at all. A newspaper in Bend, Oregon says the city’s twice-a-year open streets events are “anti-car street parties” that only serve to alienate motorists. Because no one who drives a car would ever actually get out and enjoy it themselves, apparently. Rather than patting themselves on the back for supporting environmentally and socially commendable causes, city councilors should be asking themselves whether they’re using the public’s money effectively. Does it really make sense to spend $22,500 on an alternative-transportation event that preaches to the anti-car choir even as it subtly alienates the very people whose support the city really needs? Those other people are the ones who drive cars and trucks, and they might think better of cyclists, pedestrians and so on if they weren’t treated as pariahs on their own streets and at their own expense. There’s an in-your-face quality to Open Streets that simply isn’t useful if the city’s goal is to encourage respectful coexistence by motorists, cyclists and others. Evidently, it’s only coexistence when the roads belongs to cars, period. It looks like the Marathon Crash Ride is back next Sunday after all. 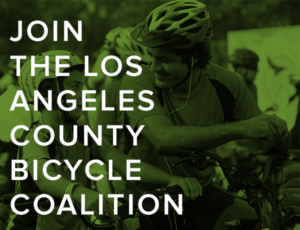 Bike the Vote LA has released their voter guide for the April 3rd primary election in California Assembly District 54, which is currently vacant following the resignation of Assembly Member Sebastian Ridley-Thomas. Don’t plan on riding the new Arroyo Seco Pedestrian and Bicycle Trail anytime soon unless you enjoy dodging golf balls; the April 22nd opening has been cancelled until they can stop errant shots from escaping from a nearby driving range. 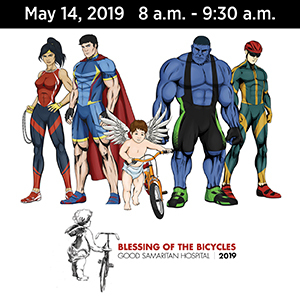 There will be a blessing of the bicycles and other mobility devices in Santa Monica on Sunday the 25th. 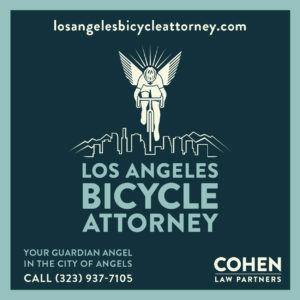 Calbike is urging you to speak with your state assembly member and senator during Advocacy Week, March 22-29, when the legislature is not in session. Dockless bikeshare is coming to North San Diego County for a one-year trial. A judge has dismissed a lawsuit from a former Palm Springs councilmember aimed at derailing the CV Link bike and pedestrian trail surrounding the Coachella Valley. Thanks to Victor Bale for the heads-up. A Menlo Park website explains what all those markings on the street mean, including bike lanes, bike boxes and sharrows. A group of veterans are riding from Florida to Los Angeles for Ride 2 Recovery, while a Navy vet is riding cross-country for raise funds for veterans through the Gary Sinise Foundation. A Seattle reporter takes a ride along a still under-construction bike lane and road diet connecting to the Amazon campus. Nothing like an insurance company that doesn’t get the law. 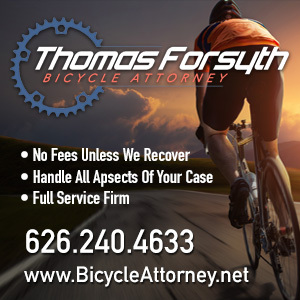 A Washington state firm tells a driver to go ahead and right hook a bike rider after passing him. Colorado letter writers take up the great ebike debate, discussing whether they should be allowed on trails. Fort Worth and Arlington TX hope to avoid the problems neighboring Dallas has with abandoned dockless bikeshare bikes. Stop de Kindermoord comes to New York as residents demand an end to children being killed on the streets. This is how Vision Zero is supposed to work. New York will redesign a street where two small children were killed while walking with their mother after a driver ran a red light. Although I don’t know any design elements that will take a driver’s foot off the gas pedal. WaPo offers advice on bike touring, with a little help from Adventure Cycling. The year’s first edition of the World Naked Bike Ride took place in Sao Paulo, Brazil on Saturday to call for safer streets. And no, the story’s not safe for work. Vancouver residents rise up in anger over the thought of a bike path besmirching a public park. Never mind that it might actually allow more people to enjoy the park. The way to encourage more bicycling in the UK is not to give bicyclists a safe passing law, then threaten them with a life sentence for killing a pedestrian. An Irish writer says cyclists are just failed runners, but he’s now going to join the MAMILs for a mid-run snack. Irish police are warning bicyclists to be careful using ride-tracking apps like Strava, which could lead thieves to your bike if you leave it on the default settings. Sad news from South Africa, where two bicyclists have died during the annual Cape Town Cycle Tour, one from a heart attack and the other the result of a 20-rider pileup; police are investigating both deaths. No bias here. A local government in Western Australia responds to the state’s new one-meter passing law by moving to ban bikes from narrow roadways, insisting there’s there’s no room for drivers to obey the law. No bias here, either. A New Zealand writer complains about male cyclists who don’t have bells on their bikes, or want them. And somehow assumes that means they’re lawbreaking scofflaws who complain about the way drivers treat them. A Chinese website considers why there’s no culture of competitive cycling in the country, oddly placing the blame on a lack of cycle tracks and conflicts with drivers. Keith Olberman talks with former pro Phil Gaimon about riding clean in the sport that’s become the poster child for doping. Cleaning your bike pedals the cute, furry natural way. When you absolutely, positively have to spend $165,000 for $27,000 worth of bike racks. And Elon Musk now says his Boring tunnels will put bicyclists and pedestrians first.